The Christmas items continue to sell, but not as fast and furious as in the last few weeks. Whew, it's been a whirlwind! I found these tree skirts (tablecloths?) stuffed inside a cupboard next to my workstation. Guess I was going to list them, and forgot. There are two, in two different sizes, covered with sequined felt appliques and green fringe trim. This Santa and his reindeer are pretty cute. The fringe is plastic. One more with Santa by his lonesome. I have a pair of these adorable plastic canvas and chenille angel tree toppers. The doll heads remind me of the Liddle Kiddles from the 1960s. I almost kept them. I am selling these vintage handmade beaded ornaments individually in one listing. Although I may have to keep the pink one! Speaking of pink, here are a bunch of pieces of pink Texas Ware melmac. Searched high and low for the match to those lids, but no luck. And a couple of Pyrex fridgies, in the Butterprint (Amish) pattern, rounds out the listings for this week. Hope you all have a wonderful and safe holiday! 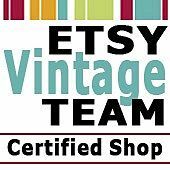 More Pyrex listed in the Etsy Project this week! Still Christmas-related though, with the snowflake pattern. This is the Black Snowflake divided casserole, with lid. Turquoise Snowflake space savers (no lids) to complete last week's listing. Fun Holt Howard Santas-in-cars candle holders (SOLD!). Another pair of candle holders -- sweet Christmas angels, with original "Japan" stickers. A white and gold porcelain praying angel, marked "MK 7/56". Remember the ceramic tree from last week? SOLD!, four days after I listed it. I decided not to go the ebay route, and I am happy with my decision. I may not have gotten the most money out of it, but it sold quickly for a very good price, and I'm good with that. I had a bunch of extra vintage bulbs, and am selling them in lots of ten. There's only one set left! I actually listed this very kitschy light-up snowman tree topper on ebay for a couple of days. It had a bunch of watchers, but I started to get anxious that there wouldn't be a bidding war, and I would wind up selling it at the lower starting bid price. So, bolstered by the sale of the ceramic tree, I pulled it and listed it on Etsy at a higher price. Again, it sold within days. I'm pretty sure that's going to be my M. O. from now on. 345. Vintage Snowman Tree Topper Light Up Kitsch SOLD! 346. Vintage Ceramic Tree Bulb Multicolor Sets SOLD! 347. Vintage Santa Car Candle Holder Kitsch Pair SOLD! Sales continue to be brisk this holiday season, and this week's Etsy Project has a few non-Christmas-y items listed too! I don't collect Pyrex, although I have a recent appreciation for it. I do have a Friendship casserole dish (the reds and yellows go well in my kitchen), and thought about keeping this Orange Dot since it complements it, but decided it was too mod for me. I also own a Snowflake casserole with lid, and am still thinking of keeping a different size or two of these lidless ones. You know I like the aqua, and the snowflakes are Christmas-y. This Indiana Glass cakes stand is minty, and seems very Christmas-y to me -- I guess it's the red box. Onto the real Christmas listings! These bulbs were made by the Henry Ford Museum for Avon in 1984. 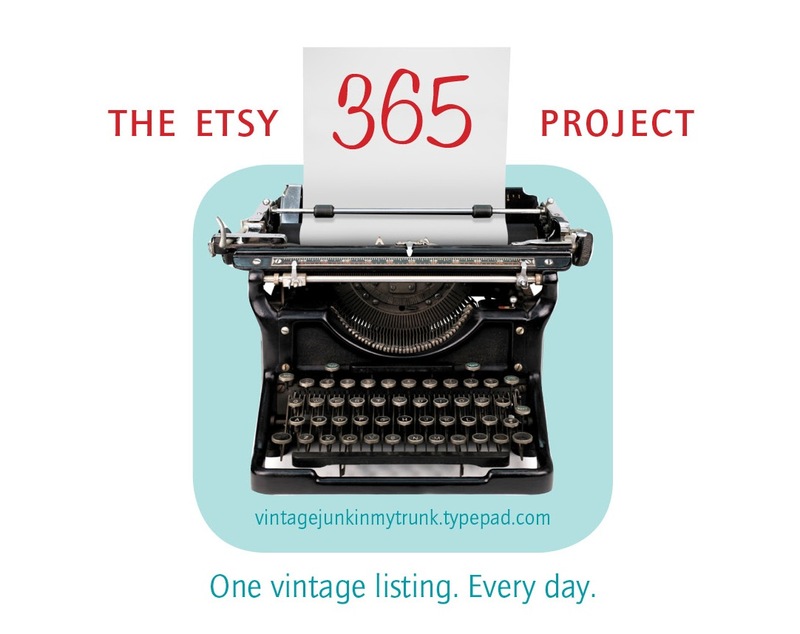 Not vintage enough for me, but good enough for Etsy! More my vintage speed -- a red Shiny Brite with stencil and mica winter snowscene. These ceramic trees are going for big bucks on ebay (especially if they are marked -- this one is by Atlantic Mold), but I didn't want to gamble on an auction. I listed it on Etsy for $125 and it sold within two days! Woo hoo! 341. Vintage NapcoWare Christmas Girl Figurines SOLD! 342. Vintage Ceramic Light Up Atlantic Mold Tree SOLD! The last of the Putz houses! They've been flying out of my shop almost as fast as I can list them. These two are already gone. I did keep a few for myself. Am still on the fence about this one. This one may be a church. This one is definitely a church, albeit in need of slight repairs. 330. Vintage Putz House Bottlebrush Tree White Red Putz SOLD! Christmas is in the house -- the Putz house(s), that is! Lots and lots of Putz houses! They all have some issues, but that's what gives them their character. This yellow one is quite large and has a balcony. Some greens and a blue. A trio of reds, all SOLD! More white ones, all SOLD! I'm still listing more Putz houses if that's what you're in the market for, but as you can see they go fast! The lone non-Putz related listing are these Noma Christmas lights from the 1930s. 326/X. Vintage Putz House Red Christmas Bottlebrush SOLD! 328/X. Vintage Putz House Tree White Putz SOLD! First up in the Etsy Project listings -- vintage double indent and tube mercury glass bead garland in blue. Some issues, but still gorgeous! A shorter strand of garland, in gold and pink. Large Putz house, made in Japan. Crazy glittered Santa on styrofoam pedestal. Large Santa face blow mold light. Vintage silver bell, mercury glass bead and reindeer corsage. Sweet cherub angel with baby Jesus bisque figurine. And now I have more packing to do! See you next week. I love November! Blustery, chilly, brisk, beautiful, November. Actually, yesterday hit 70° in these East Coast parts, so it's not been that blustery (yet), but the sales in my Etsy shops sure have been brisk! I have been at the post office nearly every day with four or five packages -- and yes, I do visit the local post office instead of doing everything online. My computer and printer don't play nicely together, it's a convenient stop along my day's path, AND I get to chat with my favorite US postal workers Alice and Joey. So, win-win. and a very large celluloid Santa face light. I have four sets of these Christmas bell lights, in their original boxes. Once again, I kinda like the box graphics better than the item inside. This box has seen better days, but the red Holiday Lite Electric Candelabra is none the worse for wear. I have multiples of these as well. and some tomato plant juice glasses -- they just happen to be red and green!